When choosing a rapid prototyping solution there are often many possible options, each with their own set of strengths and weaknesses. In this article we are going to take a closer look at three of the main types of rapid prototyping solutions available today: fused filament fabrication (FFF), stereolithography (SLA), and selective laser sintering (SLS). The resolution of FFF rapid prototyping is limited by the accuracy of the motors and user calibration as well as the print time available. Print time increases linearly as part tolerances become tighter. FFF print tolerances range from 0.05 mm to 0.5 mm with the industry average coming in at around 0.2 mm. Some interesting benefits of fused filament fabrication include the ability to easily customize infills of the objects being printed. This means that it is very simple to print prototype models for fit and finish checks with low infill, or even hollow, in order to save on material costs. Once the design has been completed final checks or low volume production runs can be done at higher infills. This feature of modulating the part infill also allows the designer to introduce unique insulating cavities into the design which would be impossible with other manufacturing methods. This is particularly beneficial for any part working under thermal loads. FFF is the preferred method of rapid prototyping parts with standard tolerances due to its affordability and low turn-around times. SLA is another example of building a model layer by layer. 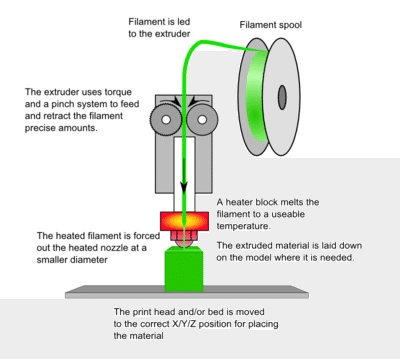 Instead of extruding molten plastic through a nozzle, the SLA rapid prototyping process requires a liquid plastic resin called a photopolymer. This photopolymer material is then cured by an ultraviolet (UV) laser to form a solid geometry. This process is even more comparable to a CNC operation as the SLA machine requires an excess amount of photopolymer to complete the print. The common g-code format is used to translate the CAD model into assembly instructions for the printer. An SLA machine typically stores the excess photopolymer in a tank below the print bed. As the print process continues, the bed is lowered further into the tank curing each layer consecutively along the way. Once the final layer is complete the bed is raised out of the tank, exposing the solid 3D model. This part is then rinsed with a liquid solvent to remove any photopolymer that was not cured. Resolution of SLA rapid prototyping varies from 0.05mm to 0.15mm with the industry average tolerance around 0.05mm. On average this is significantly more precise than FFF. Therefore, SLA is the preferred rapid prototyping solution when extremely tight tolerances are required. This is mainly because the cross sectional area of the laser can easily be made smaller than the extruder nozzle in the FFF method. Due to the smaller cross sectional area of the laser, SLA is a significantly slower fabrication method than FFF. Small parts take hours and large parts can take days to complete. Additionally, the material costs are significantly higher due to the proprietary nature and limited availability of the photopolymers. This method is typically not compatible with production runs for these reasons. SLS is a very exciting technology which directly fuses particles together layer by layer through a high energy pulse laser. Similar to SLA, this process starts with a tank full of bulk material, but this time in powder form. As the print continues, the bed lowers itself for each new layer as done in the SLS process. Overhangs are naturally supported by the excess bulk powder material. 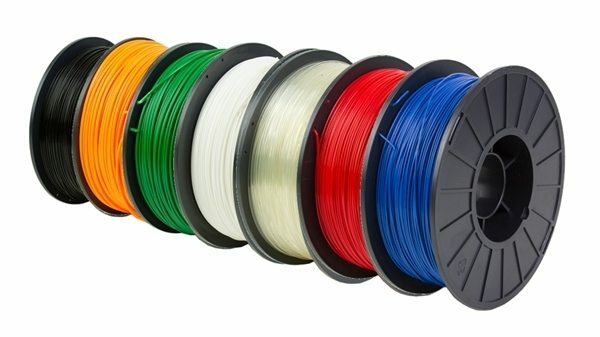 Therefore, complex features are much more simple to print than using FFF or FDM 3D printing methods. The bulk material is typically heated to just under its transition temperature to allow for faster particle fusion and print moves. SLS 3D printing is particularly exciting because of the flexibility of materials that can be used. Both plastics and metals can be fused in this manner, creating much stronger and more durable prototypes. The quality of the powders is dependent on the suppliers proprietary processes. However, the base materials used are typically more abundant than photopolymers, and therefore cheaper. Additional costs in energy used for fabricating with this method are comparatively high. These additional energy costs may reverse any savings realized in the lower SLS material cost. Speed and resolution of SLS typically match that of SLA, with industry averages at around 0.1mm tolerances. Due to the relatively slow fabrication speed, this method is only suitable for low volume production runs of small, precise parts. SLS is the preferred rapid-prototyping method of metals and exotic materials.